As a child, the best part of any car show is always the supercars. They can spark an automotive obsession that lasts a lifetime – take it from me. You never forget your first supercar. They prompt daydreams of open roads, howling engines and fighter-jet acceleration, even among those not old enough to drive. Supercars end up scribbled in the margins of school notebooks. They’re Hot Wheels come to life, big enough to sit in. Compared with the practical new vehicles that make up the majority of any autoshow, supercars are alien. Their impossible curves, wings and vents have nothing in common with Earth-bound hatchbacks and SUVs. By way of example, at the Canadian International AutoShow in February, the collection of supercars was worth more than $30-million. Come to think of it, even as an adult, the best part of any car show is still the supercars. Next up is New York’s, in mid-April. A Jaguar XJ220 sits flanked by a Ferrari 550 Barchetta and a Ford GT40. This particular XJ220 was used in the Gone in 60 Seconds remake starring Angelina Jolie and Nicolas Cage. Jolie gets out and says, “God, I love that car.” Only 281 examples of Jaguar’s supercar were built between 1992 and 1994. Despite having a twin-turbocharged V-6 engine with 542 horsepower, the XJ was a bit of a flop for the brand. Its status as the fastest car in the world didn’t last long; the 1994 McLaren F1 instantly made the Jaguar obsolete. The Ferrari Formula I F50 shown on display at the International Motor Show in Geneva, Switzerland, on March 8, 1995. In 1996, this was as close as you could get to owning a Formula One racecar for the road. The 4.7-litre V-12 engine is closely related to the motor found in Ferrari’s 1990 F1 contender, driven that year to a second-place finish in the championship by Alain Prost. Ferrari had this F50 on display at 1996 Tokyo Motor Show. It was since imported from Japan and now belongs to Phil Trigiani, a Ferrari collector with a large following on Instagram, under the handle @mrtrig. A 5007 HP Devel Sixteen car on display at the Canadian International AutoShow in Toronto, Feb. 15, 2019. The numbers seem too outrageous to be true, and they might be. The Devel Sixteen has been kicking around as a concept car since 2013. The company claims the car’s quad-turbo V-16 engine makes 5,007 horsepower. The prototype at the Toronto show looks quite rough. The car costs $2.2-million, but if they want a deposit from us, we’ll need more proof the Sixteen is, you know, real. Meet Aston’s new flagship. Driving the DBS quickly requires no small amount of bravery. The twin-turbo V-12 makes 664 lb-ft of torque from just above idle. Pressing the accelerator is like lighting a missile with a very short fuse. It slams you back in your seat like few other cars can. A spokesperson for Grand Touring Automobiles, Aston Martin’s Toronto dealer, said pre-orders for the DBS have vastly exceeded expectations. A Maserati MC12 on display at the Los Angeles Auto Show in Los Angeles, Calif. on Nov. 30, 2006. There are only 50 of these in the world. It’s a Ferrari Enzo extensively modified by Maserati to homologate a racing car for the FIA GT World Championship series. It’s longer, lower and wider than the more road-oriented Ferrari. Located just behind the driver is a 6.0-litre, naturally-aspirated V-12 good for 630 horsepower. This 2005 MC12 comes from the personal collection of Canadian entrepreneur Miles Nadal. 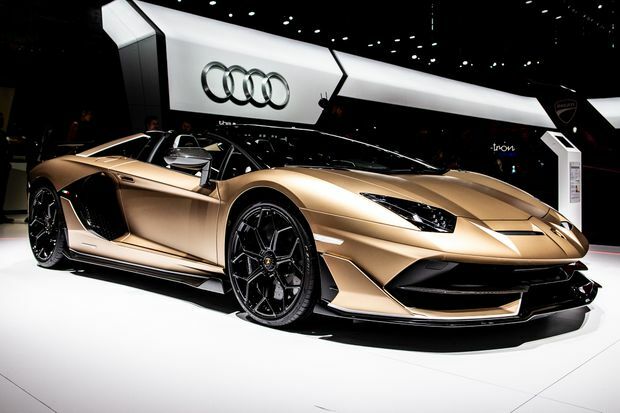 Lamborghini Aventador SVJ Roadster shown at the 89th Geneva International Motor Show on March 6, 2019, in Geneva, Switzerland. Of all the exotic cars here, the Aventador sticks closest to the classic supercar formula. It features a naturally aspirated, 759-horsepower V-12 engine mounted in the middle of wedge-shaped lump of carbon-fibre and aluminum. This purple car costs $680,380. The SVJ is the ultimate expression of the Aventador, righting many wrongs of the original version launched in 2011. For example, the SVJ turns eagerly, where the old one really didn’t want to turn at all. 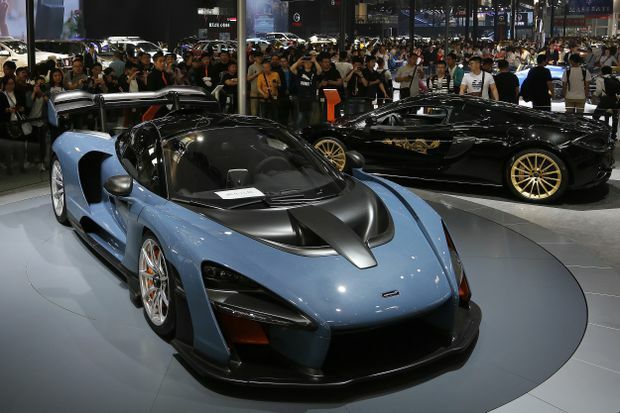 Visitors gather to look at a McLaren Senna during the China Auto Show in Beijing on April 29, 2018. The Senna is an exceptionally special car. McLaren will only build 500, each with a price of US$1.2 million. However, someone thought it wasn’t quite special enough, ordering this Senna with exposed carbon-fibre bodywork that costs an extra – wait for it – $400,000. Despite the hefty price, the Senna has proven popular with Canadian customers; there are, at last count, 25 examples coming to Canada, according to a company spokesperson.